Several new entrants from the food and beverages sector have forayed in the apple cider vinegar market. This is likely to up the intensity of the competition in the coming few years. Some of the prominent names in the global apple cider vinegar market are Manzana Products Co., The Kraft Heinz Company, Carl Kühne KG (GmbH & Co.), GNC Holdings, Inc., and PepsiCo, Inc. 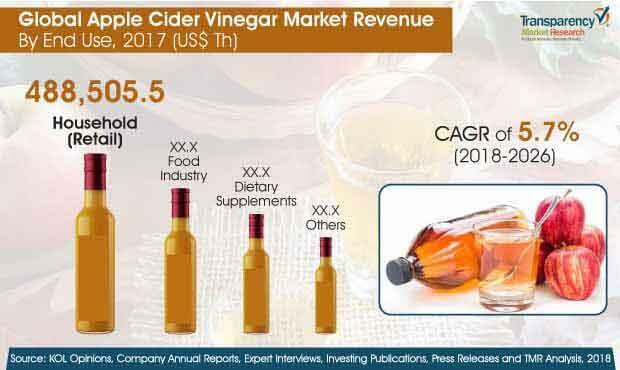 The global apple cider vinegar market stood at US$745.8 million in 2017. Garnering a CAGR of 5.7% during 2018–2026, the global market is projected to reach revenues worth of nearly US$ 1,229.2 Mn by 2026. Among the various forms, liquid apple cider vinegar products appears to be the most preferred. In 2017, the segment alone occupied 87.6% in the global apple cider vinegar market. The liquid form is likely to remain increasingly popular in the next few years, as well. Regionally, North America is likely to serve the majority of demand over the forecast period in the global apple cider vinegar market. A key factor propelling growth in this regional market is extensive demand for naturally-sourced products among rising health-conscious population. The worldwide drive for apple cider vinegar market stems from the need for food and beverages with substantial health benefits. Growing populations who want to leave a healthy life are bolstering the demand for products such as apple cider vinegar. This has stoked the popularity of apple cider vinegar in food flavorings and preservatives. The global apple cider vinegar market has gained noticeable impetus from its wide range of health benefits. These benefits are backed by growing body of scientific literature across the world. The demand for apple cider vinegar is also bolstered by the vast purported benefits of apple cider vinegar in cardiovascular health. The antibacterial and antifungal properties of apple cider vinegar makes it promising for controlling diabetes and obesity. Growing population of millennials who are demanding food and beverages for supporting healthier lifestyles lends solid push to the demand in the global apple cider vinegar market. The awareness among them has been fueled by increasing prevalence of acid reflux, high cholesterol, and heartburn. Moreover, growing worldwide menace of obesity is a notable trend catalyzing the consumption of apple cider vinegar and various recipes based on it. Changing trends in health and wellness in developing regions has opened a large window of opportunities for players in the global apple cider vinegar market. However, there are a few regions where people are still oblivious of the benefits of apple cider vinegar. This has hampered the prospects of the market. On the other hand, apple cider vinegar is increasingly demanded in skin and hair care. Improvements in formulations of apple cider vinegar with various other products are impeding the growth of the apple cider vinegar market. Increasing preference of producers and retailers in the global apple cider vinegar market toward e-commerce channels is imparting a large momentum to the market. They are increasingly reaping lucrative gains from the growing sales of their products through e-commerce, in various developing regions. The advent of organic products has considerably expanded the prospects of the global apple cider vinegar market.